Jim Carter is Candidate for County Commissioner of our Precinct 4! We are so fortunate to have such a qualified and experienced candidate! Of the 4 Republican candidates, Jim Carter is the only candidate with County Government experience. He served 8 years as our County Commissioner. He is already familiar with the individual and unique needs of each of the 17 small and medium size towns and cities in our Precinct 4. And he has already worked with many of the Mayors and Elected Officials on their critical road and drainage projects. Jim Carter is an active participant of First Responders! As County Commissioner, Carter sponsored the founding of Denton County Emergency Services District #1. ESD #1 provides quality fire protection and emergency medical services to 65 square miles of Denton County. Coverage includes the 5 towns of Argyle, Bartonville, Copper Canyon, Double Oak and Draper – AND – unincorporated county communities like Canyon Oaks, Lantana, and Robson Ranch. Carter is in his 7th year as President of ESD #1. Carter instigated coverage of Robson Ranch by the ESD’s new fire station in nearby Northlake. This was a project of collaboration between ESD #1 President Jim Carter, Argyle Fire District Fire Chief Mac Hohenberger, and City of Denton Fire Chief Robin Paulsgrove. Reducing the response time of ambulances to Robson residents and others in the ESD’s 65 square miles can also can save lives. For every minute saved reaching a heart attack victim, their chances of survival increase by 10 per cent! The reduction in ISO ratings for fire protection could save a Robson homeowner an estimated possible $1,000 per year in homeowner’s insurance premiums. Carter has also just been re-elected to a second two year term on Denco 911, which serves all of Denton County. He was elected by 27 Denton County municipalities out of 30 voting! Carter is a candidate who does not just “talk” about supporting First Responders. He actively does so with his time and leadership! Carter received his Finance Degree from the University of Georgia and post-graduate work included the American Management Institute. He was the youngest Financial Director for the Chevrolet Division of General Motors and was senior Vice President for Frito-Lay Corporation in charge of all domestic development in the United States and all international development around the world. 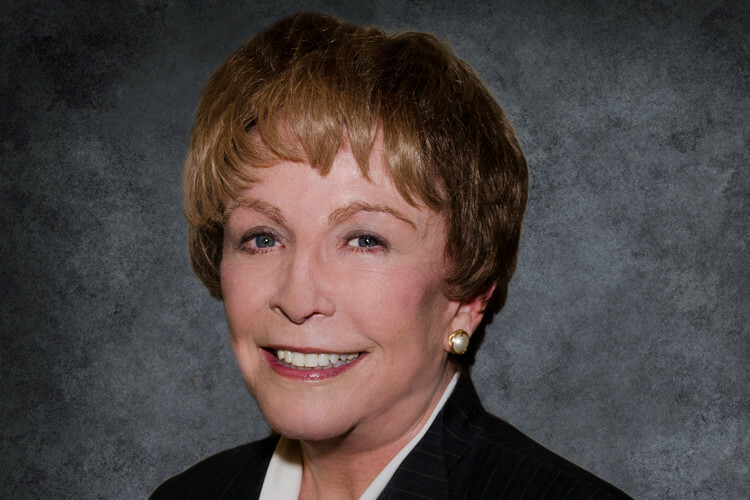 As CEO of Mercantile Corporation in Fort Worth, Carter supervised three area banks, a construction company, and developed 2,000 acres of prime commercial development alongside I-35W in downtown Fort Worth. Jim Carter believes each town and community should have the type of quality development they desire. OR alternatively – any community that treasures just the way they are without further economic development, should have their preferences respected. He does not believe the County should dictate to the Cities and Towns what their individual future should be. But the County can greatly facilitate quality growth for those communities that want it. And Carter has the personal business background to know how to attract quality corporations. 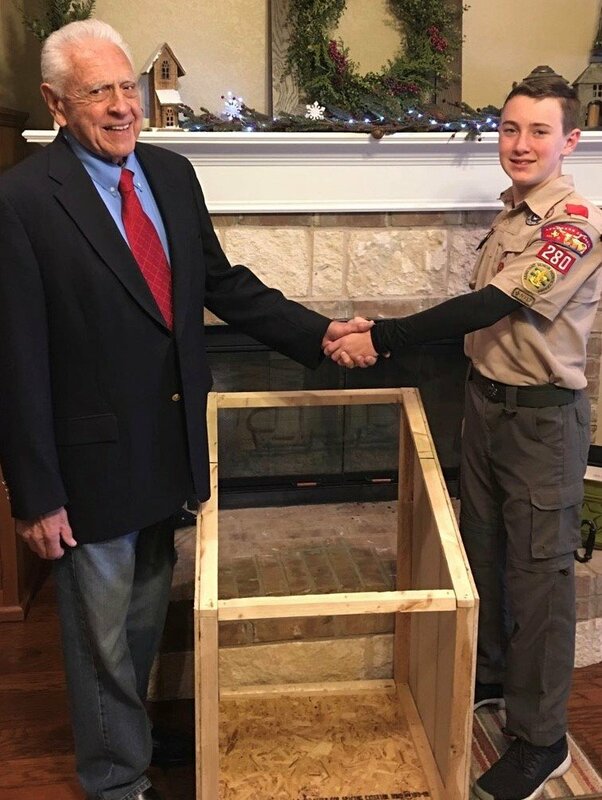 Jim Carter congratulates Life Scout John Amarante on his Eagle Scout project with a Scout handshake. The handmade boxes will be placed in each ESD #1 fire station in Denton County for the proper retiring of used American and Texas flags. Most of what I really need to know about life, and what to do, and how to be, I learned in Boy Scouts. Wisdom was not at the top of the graduate school mountain, but there in my scout troop. These are the things that I learned: That we all have honor and we are to do our best no matter what we face. We have a duty to God and Country and we are to do everything possible to perform that duty to the best of our abilities. Those abilities can be improved if we obey the Scout laws. We have a God ordained decree to help other people, not only if it’s convenient or where other people or watching, or that we may receive some benefit or reward. We are to help other people at all times. I learned that it was important and expected that I keep myself physically strong, mentally awake, and morally straight. These qualities have been most important in my adult life. Scouts are to “Be Prepared.” Prepared to accept challenges, opportunities responsibilities, , to perform at a highly efficient level, to care, to love, to be a friend, accept credit or blame, to stand tall in the face of adversity, and to look for the best in other people. Scouts are to use the buddy system when in deep water, whether liquid or not. As a Scout I served in leadership roles and learned that with leadership privileges come responsibilities to serve the patrol, the troop, the company, the Church, and be highly concerned about the members of each organization. I learned to protect the environment. To leave the campsite better than I found it. To pick up after myself and to practice safety at all times. I learned lifelong skills and interest in hobbies by the experiences I had in scouts. I learned when in a dark cave, it is best to hold hands. I learned there are certain laws – called the Scout Law – that if followed would help me live a full and useful life. They commanded that a scout is trustworthy, loyal, helpful, friendly, courteous, kind, obedient, thrifty, cheerful, brave, clean, and reverent. Think of what a better world it would be if we all – the whole world – subscribed to the Scout Oath, the Scout Motto, and the Scout Laws, or if we had a basic policy in our nation, and other nations, to always practice the buddy system, to protect the environment, and to leave the campsite better than we found it. To reach out our hand to help anyone in need or in the dark. To eliminate all barriers to world harmony and to remember as adult leaders in the scouting program that our only motive should be “we are doing it for the boys” and not for any other selfish purpose. Now I bid you farewell with a benediction I learned as a youngster in Troop 33 of Atlanta, Georgia – many, many years ago – May the great Scoutmaster of all good Scouts be with you till we meet again. How great if our County campaign season began with this Scout philosophy! The Republican and Democratic Primary Elections will be held on Tuesday, March 6th, from 7 to 7. Early Voting for County Officials runs Tuesday February 20th through Friday March 2nd.